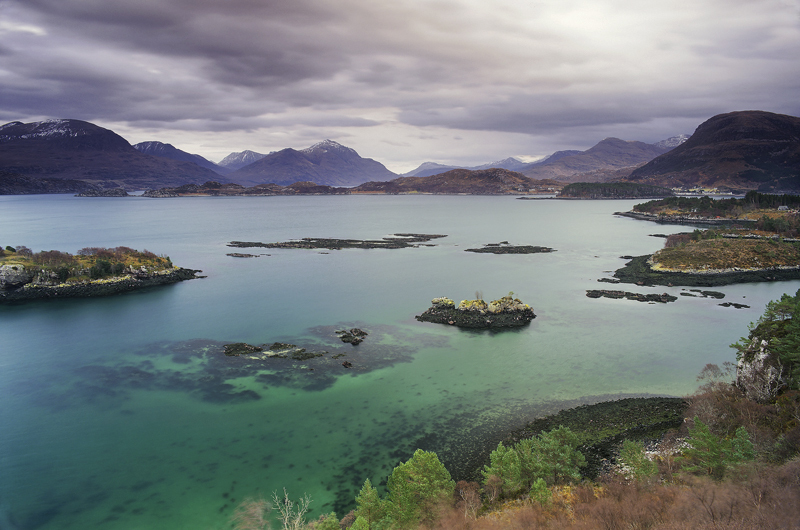 This is a favourite viewpoint of mine tucked away on a hidden ledge overlooking the tiny village of Shieldag at the end of Lower Loch Torridon. This stunning viewpoint needs to be visited in the right conditions namely low to mid tide when the sea is at its most vibrant, preferably on an overcast day that controls the reflected highlights on the water and helps a polariser cut through surface glare and hopefully with just a dash of sunlight squeezing through low cloud to paint the mountains. This is pretty close to ideal though a bit more dappled sunlight would have been nice on the peaks.